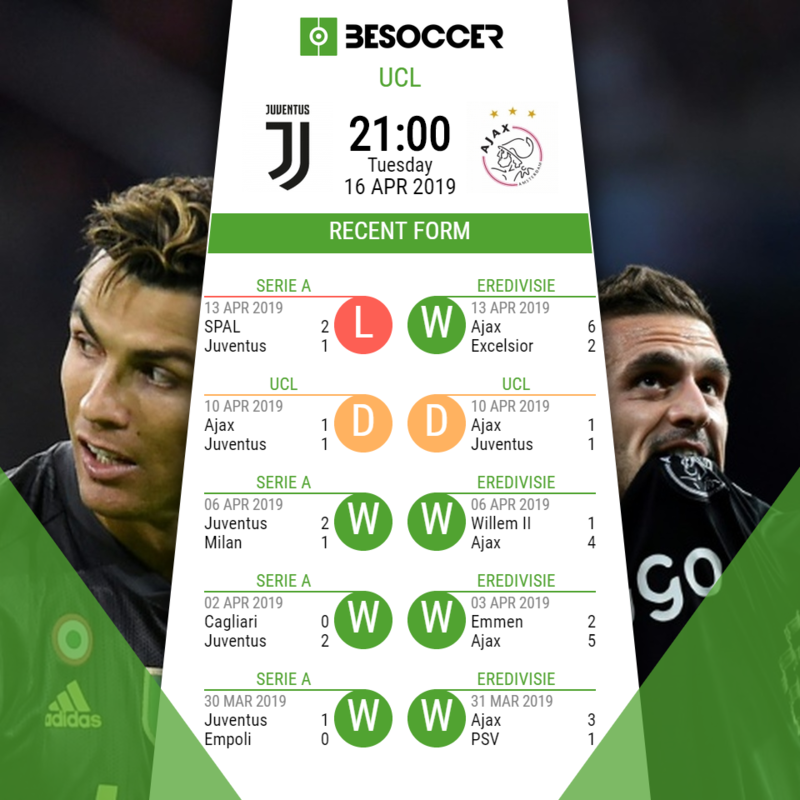 Ajax travel to Turin for the second leg of their finely poised Champions League quarter-final tie on Tuesday after a 1-1 draw in Amsterdam last week. Massimilano Allegri faces something of a selection headache with a number of important first-team members set to miss the game. Giorgio Chiellini, Douglas Costa, Emre Can and Martín Cáceres are all expected to miss out, with midfielder Blaise Matuidi facing a race to be fit after limping off in Amsterdam a week ago. After sitting out Juventus' disappointing Serie A defeat to SPAL on Saturday, Cristiano Ronaldo should be fit as he looks to add to his goal in the first leg. Allegri has some big decisions to make going forward, with in-form wonderkid Moise Kean pushing for a start and the struggling Paulo Dybala likely to drop to the bench once more. Barcelona-bound midfielder Frenkie de Jong is an injury doubt according to manager Erik ten Hag after tweaking his hamstring against Excelsior, and the four-time european champions will also be without influential left-back Nicolás Tagliafico through suspension. Hassane Bande and Carel Eiting will also miss out through injury. "If De Jong plays tomorrow night then we need to put pressure on him. But we need to win tomorrow and qualify for the next round regardless whether he plays or not. It will be a physical game." "Juventus are the favourites, especially after the Amsterdam result. If we play well, we can overcome any limit." "I'm confident because of the way we are playing and training. We are stronger and we are showing it game by game."